By 2017 the world economy has collapsed. Food, natural resources, and oil are in short supply. A police state, divided into paramilitary zones, rules with an iron hand. Television is controlled by the state and a sadistic game show "The Running Man" has become the most popular program in history. All art, music, and communications are censored. No dissent is tolerated and yet a small resistance movement has managed to survive underground. I was always kind of curious about the nature of the relationship between this movie and the 1990 Williams arcade game Smash TV. Smash TV was AWESOME, a game I was never able to play enough. I will totally have one in my hypothetical future home arcade. The movie is fun, but I much prefer the original Stephen King (as Richard Bachman) version. Ugh, I haven't seen this in like twenty years. The book is much better but also has a much wider scope with some really killer world-building. RIP Richard Dawson. Anyone up for a Bachman Books fanfare post? One of the classic novels is very difficult to find post-Columbine. And everything is dire, and the world is fucked, and of course television is somehow to blame, etc. One of the classic novels is very difficult to find post-Columbine. Only to the extent that Rage is the only one of King's novels that isn't still in print. Look for "Bachman Books" on Amazon and used copies abound. * Rage - Fine, I guess? The kid seemed pretty believable as a character, even though the plot got kind of unbelievably Lord of the Flies-y. * The Long Walk - I loved this. Why has this not been a movie? * Roadwork - Fine as a character study, but *way* bloated, should have been cut by half. 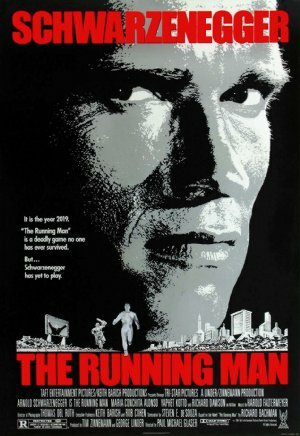 * The Running Man - Great. I love when King worked with SF ideas. * Thinner - Meh. Felt pointlessly gross. Wikipedia says it's been optioned by Darabont which is promising. AKA: Hunger Games, 80s Edition. The Long Walk - I loved this. Why has this not been a movie? I love the Long Walk, but in all honesty - how many King stories have actually been translated to screen and still been good? Stand By Me was a fine film based on The Body; and I know that many people despise The Shawshank Redemption, but I would also put it forward. The Running Man and The Green Mile are pretty solid. And while it's not my cup of tea, The Shining. I guess I'm saying that I don't want to see someone try to put The Long Walk on screen; there have just been too many failures and I'd rather not see the one King-as- Bachman story I think is good suffer the usual fate. The Running Man was a good story and they should make a movie based on it at some point. So RAGE and the 4-story Bachman Books are both out of print? If that is so it's possible someone on metafilter has a mobi of RAGE and would share it without ethical qualms. I mean King has asserted his moral right to withdraw the novel from further sales and publication. God, that was a weird derail. I did like the face replacement CG sequence. It's not often entertainment admits that it will change and perhaps not for the better. I've not read the book, but the wikipedia description of it sounds like a really great story to make a film of. Though the ending may need to be changed a little? Not sure american moviegoers are ready to accept a hero flying a plane into a skyscraper quite yet. I always assumed that "Sven" Killian's bodyguard was Richards' brother back from the re-education camps. But I don't see it mentioned on wikipedia, so, I guess not. It's not often entertainment admits that it will change and perhaps not for the better. In retrospect, it's a little scary how some of the Bachman stories seem prophectic. Rage came out in 1977; The Long Walk in 1979 and The Running Man in 1982 and yet all have elements that capture some things about society, culture, and the media really well. Anyways, I don't want to keep on a Bachman books derail (or maybe I should make a Bachman books post). I loved the fact that Richard Dawson was so willing to play the evil game show host; he made the film go from being a solid 80's action thriller to being a memorable 80's action thriller. For people of a certain age, it was a reminder that Richard was more than the host of Family Feud, but also an accomplished actor/performer (Hogan's Heroes, Rowan & Martin's Laugh-In). RIP Richard. Dawson's turn in this movie has always reminded me of Jerry Lewis in "The King Of Comedy".